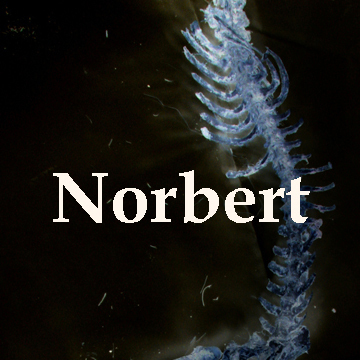 Norbert is a stop animation of a deer whose skeletal remains were still held together by tendons allowing his joints to be articulated. With hind legs stretched out, and no front legs at all Norbert resembled an eight-foot human with deer head. In the video Norbert is a dancing skeleton. The Canadian responce to George Meliers (the grandfather of special effects), Yan Svankmajer and Omodoko (Japanese video artist). He dances by himself until attracting the attention of his friend Mark.